We ask that you register for the following baby/toddler classes so that we can properly prepare. However, we know that having a baby or toddler make for some interesting days so if you end up not making it that is ok, just let us know and you can use the credit for the next class. Also for our baby/toddler classes if you register for four classes at a time you will get a 10% discount. Baby Michelangelo: This is a time where we push tables back and allow little ones to explore the studio safely while mothers connect with other mothers. Ages: Infant - 24months Thursday 9:00am - 9:40am ($10+tax/class). 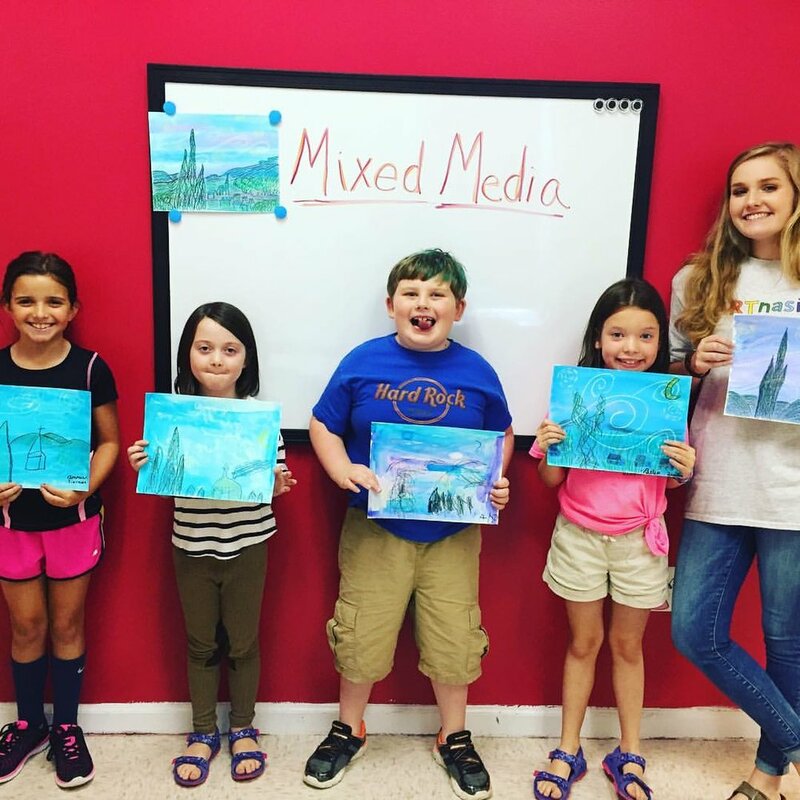 Van Gogh on the Go: Van Gogh on the Go classes will focus on early art skills with mixed media. We will have fun getting messy and exploring art. Ages 18 months-3 years old Thursday 10:30am - 11:10am ($10+tax/class). Register by calling 256-858-1870 or emailing us at theartnasium@gmail.com. The following classes require registration. A non refundable registration fee of $50 will hold your spot in class and be applied to your first month of class. Rembrandt Preschool: Preschool classes work on fine motor skills while learning how to use different mixed media and how to take care of our supplies. We will do fun engaging projects that will inspire children to begin to think creatively. Classes begin August 9th. Ages: 3.5, 4&5 year olds Thursdays 1:00pm-1:40pm ($50/month). For more information or to register call the Studio at 256-858-1870. Rockin' Rockwell Academy: In this class young artists will have fun learning different techniques using different mixed media materials and create their own masterpieces. Please call the studio for more information on the class and topics of study. Classes begin August 9th. Grades K-2 Thursdays 3:30pm-4:10pm & Grades 3-5 Thursdays 4:15-5:00 ($50/month). For more information or to register call the Studio at 256-858-1870.